On the night of 26 May 1993, a car bomb was detonated outside Florence’s famous Uffizi Gallery. Five people were killed, many injured, and a large section of the gallery was damaged (Fig 1). Included in the destruction was the extraordinary feature known as the Vasari Corridor . Most visitors to the Uffizi are not even aware that this corridor exists ~ its entrance is hidden behind an unmarked door on the first floor. But it has an intriguing history, and holds some of the Uffizi’s great treasures . 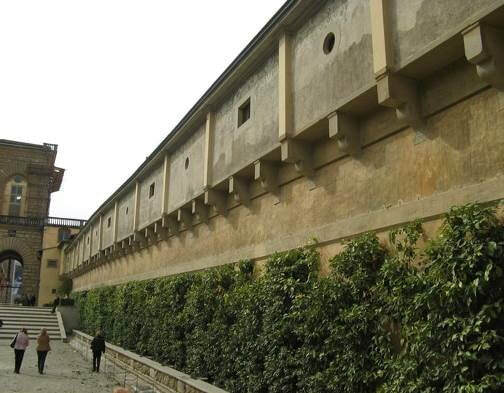 ​The corridor is a kilometre-long elevated passageway that connects the Gallery and the Palazzo Pitti, chief residence of the Medici family. It was originally constructed in the 16th century so that the Medicis could move freely, safely and unseen, in a specially-designed carriage, from their home to the government’s headquarters at Palazzo Vecchio (Fig 2). 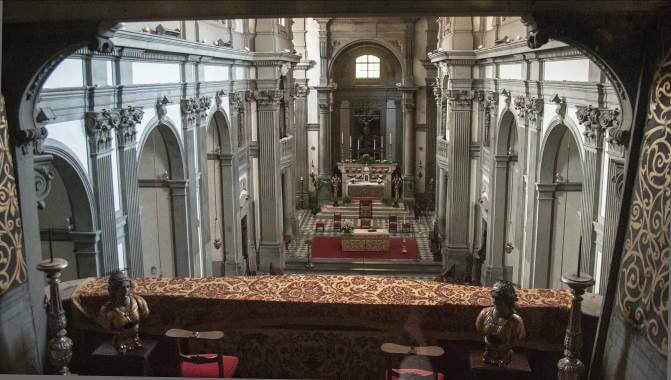 From the elevated Corridor, the Medicis could look out from its many windows onto the city and its occupants below, and even enter their private box in the Church of Santa Felicita, the Medici family church. 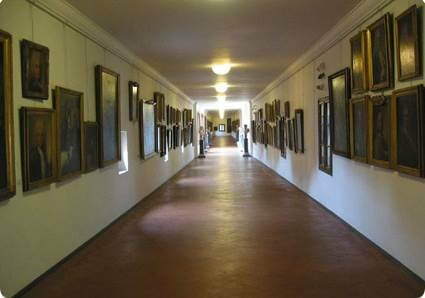 The Corridor later became the home for a vast array of paintings, mainly from the 17th century onwards, together with a special collection of over a thousand artists’ self-portraits. Entry to it has always been restricted, and it has been closed for long periods due to damage during World War II, the 1993 terrorist bomb, and periodic refurbishments . The Corridor features works from male artists such as Andrea del Sarto, Filippo Lippi, Rembrandt, Velazquez, Delacroix and Chagall, and includes just 21 women, including Elisabeth Vigée-Le Brun, Rosa Bonheur and Angelica Kauffman . But for our purposes, we want to draw your attention to just one of these treasures ~ this compelling self-portrait by a now-obscure painter by the name of Arcangela Paladini . Arcangela Paladini, born in Pisa on the cusp of the seventeenth century, was a painter, singer and poet. In her short life – she died at only 23 – she achieved enormous success, being fêted by the Medici court and fashionable society for her prodigious skills and versatility. Today, however, she is hardly known at all outside scholarly circles. Arcangela was born in 1599 and her talents emerged in early childhood. Her father was a sculptor and artist , and the youthful Arcangela evidently enjoyed experimenting in his workshop, copying his works and making designs for embroidery . Her obvious interest encouraged her father to give her lessons , and she went on to become proficient in singing, playing an instrument and poetry . An 18th century account notes that “in each of these studies she demonstrated such accomplishment that she caused amazement, not only among her fellow citizens, but even among foreigners who often came to Pisa with the desire of seeing and hearing the young virtuoso perform, and also to bring back her embroidered work, or their own likeness in a portrait” . Arcangela’s precocious talents soon gained the attention of the Medicis. 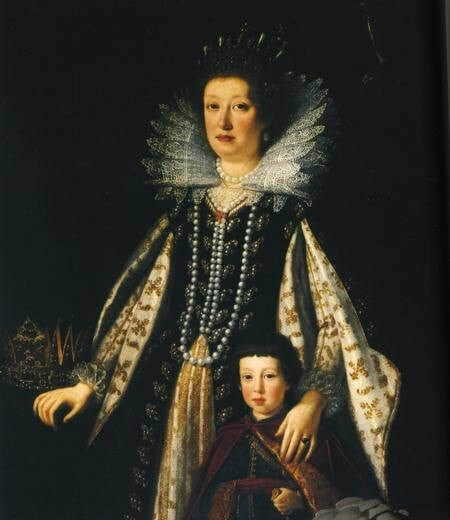 At age 11 she was invited to Florence by Grand Duchess Maria Maddalena, wife of Grand Duke Cosimo de’ Medici (Fig 6). The Grand Duchess supported her initial placement in the Monastery of St Agatha, one of the wealthiest in the city, where she stayed for six years , in an atmosphere conducive to artistic development. The Grand Duchess was later instrumental in arranging the marriage of Arcangela, by now aged 17, to Jan Broomans, a tapestry maker who was also serving in the Medici Court. The marriage was apparently happy and productive. Arcangela had a daughter, whom she named Maria Maddalena in honour of her patroness, and her skills in embroidery and tapestries provided a happy conjunction of interests with her husband. The Grand Duchess had become virtually a Fairy Godmother to Arcangela, not only enabling her to serve at court as an artist and singer, but arranging commissions and introducing her to Cosimo, thus securing patronage at the highest level. She commissioned Arcangela to create the self-portrait at Fig 5, and insisted that it be seen by members of the court. The painting was given a place of honour in the Grand Duchess’ own room. Numerous other commissioned works have been recorded , but all appear to have been lost or possibly languish in back rooms, either misattributed or unrecognised. Her self-portrait is, unfortunately, the only one that has survived. We may, however, have another view of her. Arcangela may well have known her contemporary Artemisia Gentileschi, and it has been plausibly argued that she was the model for one of Artemisia’s paintings of St Cecilia (Fig 7) . 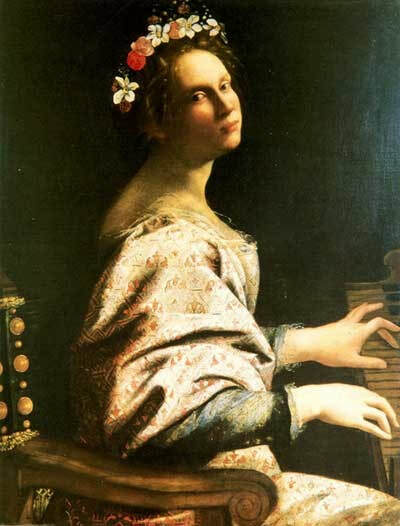 Fig 7: Artemisia Gentileschi (attrib), St Cecilia Playing the Keyboard (1620, private collection). Arcangela’s musical skills were also in demand. She sang for the court on many occasions, “entertaining the gathering of upper nobility that flocked to the royal palace by singing and playing” , sometimes in company of the prominent composer, harpsichordist and soprano Francesca Caccini. Michelangelo Buonarotti the Younger -- grand nephew of the sculptor – is also recorded as having chosen “Lady Arcangiola" to sing for his comedy La Fiera, presented at the Medici Court in 1618 . Arcangela was also “famous for her role as St Cecilia in a Florentine staged performance in 1619” , and began to be admiringly described as “Madama Serenissima or “La Cantrice della Serenissima” . An illustrious future seemed assured. Suddenly and unexpectedly, it all came to an end. We don’t know why Arcangela succumbed to an early death in 1622. But we do know that it prompted an extraordinary outpouring of tributes. The Grand Duchess commissioned a marble tomb, with a sculpted bust of Arcangela, flanked by reliefs of Apelle holding a palette and Athena with a harp. A poem of praise by Andrea Salvatori inscribed below the bust records that she “sang for Etruscan kings, now sings for God. Truly Paladini equalled Pallas Athena in needlework, Apelles in painting and the Muses in singing... Scatter this stone with roses for here, innocent in her celestial song, lies the Siren of Tuscany and the Muse of Italy” (Fig 8). 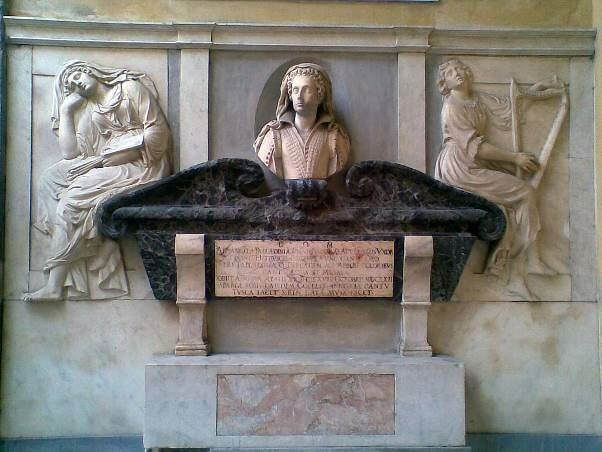 As an indication of the Medici’s extraordinary respect, the tomb was placed in the Church of Santa Felicita, their family church adjoining the Vasari corridor. This was a rare honour. If you ever visit the Church , you can still see Arcangela’s tomb there today. The Grand Duchess also granted a dowry of 1000 shields to Arcangela’s daughter with the obligation, if she had to change her name on baptism to take nuns’ orders – as she subsequently did -- to take the name of “Arcangiola”. The aim? To “preserve the name of her mother in the world” . Despite all the advantages that Arcangela enjoyed – justifiably so – both she and her work seemed fated to pass into obscurity. Her early death cut off her career tragically short. In addition, for one reason or another, her entire output was lost, save for the unforgettably assured self-portrait. And even this sole survivor is destined to be seen by only a select few in the Vasari Corridor, a situation exacerbated by the prolonged closure of the Corridor at various times due to terrorist damage, or by ongoing refurbishments. With the recent increase in interest in women artists, it may be that Paladini may yet emerge into more public consciousness. Indeed, a play based on her life was written in 2004 . With a talent such as Paladini’s, however, we can only wonder what might have been. ​This article may be cited as Philip McCouat, “Forgotten Women Artists: #1 Arcangela Paladini”, Journal of Art in Society, www.artinsociety.com. ​We welcome your comments on this article. If you enjoyed it, you may also enjoy Toulouse-Lautrec, the Bicycle and the Women’s Movement.